This is an unofficial sequel to the NES game Yo! Noid created for Waypoint's New Jam City 2017 game jam. Unlike the first game it is not a 2D platformer, instead emulating the gameplay and aesthetics of 90's 3D platformers. In the game the player plays as the titular Noid, whose trusty yo-yo has been stolen. 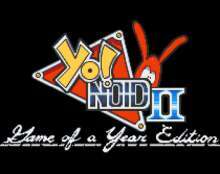 The Noid must go on a quest to find his yo-yo and take revenge on the individual who stole it. The game plays like a standard 3D platfromer. The Noid has multiple skills he can use to traverse the game's levels, he can jump, wall run, wall jump, and using his yo-yo can also grapple onto specific points to swing from them. The yo-yo is also used to pull levers, open doors, and fling projectiles. The player has unlimited lives and the levels have a fairly generous amount of checkpoints. An updated version Game of the Year Edition was later released in June/2018 which adds a few additional features such as: An updated pause menu; A "Remaster" option which disables the 4:3 letterboxing and other post-processing effects; Four additional playable characters; And a secret ending.